One of the great fascinations of opera is observing the divergent ways in which literary source materials are adapted for the stage. In many instances, great works of literature prove poorly suited to operatic treatment, whereas poetry, prose, and drama of lesser quality thrive in partnerships with music. The works of Ovid, Shakespeare, Schiller, and Pushkin are lodes of operatic potential mined again and again by composers known and forgotten, but which qualities account for the prevalence of these authors’ texts among operatic endeavors? Why is a writer such as Sir Walter Scott a frequent inspiration for composers while the novels of Charles Dickens are rarely given operatic treatment? In this sense, opera is a realm of missed opportunities. What heights of expression could Verdi have reached with Hawthorne’s Hester Prynne and Arthur Dimmesdale? What might Bartók have made of an opera based upon a plot taken from the phantasmagorical imagination of Edgar Allan Poe? What fires might have been ignited by Richard Strauss in the frigid Nordic environs of an Ibsen scenario? Offering a case study in the difficulties that often complicate marriages of words and music, the journey of Thornton Wilder’s iconic play Our Town from page to operatic stage was anything but easy. First performed in Princeton, New Jersey, in 1938, Wilder’s dramatization of small-town American life and the deceptively stereotypical relationships among the inhabitants of the invented burgh of Grover’s Corners, New Hampshire, gave contemporary theatre one of its cornerstone works, one in which all artifice was stripped away in pursuit of an undiluted, unsentimental examination of humanity’s absurdities. Our Town’s operatic potential was recognized almost as quickly as its cinematic appeal, but first Wilder and later his estate denied usage rights even to as lauded a composer as Leonard Bernstein, whose promise as an adapter of Our Town was exhibited in his unwieldy but touching opera A Quiet Place. Though his score for the 1940 film version of the play and his own opera The Tender Land hint at how an operatic Our Town by Aaron Copland might have sounded, Wilder and his literary executors were right to seek for Our Town the sort of organic connection between text and composer that Colette’s L’enfant et les sortilèges found with Maurice Ravel. 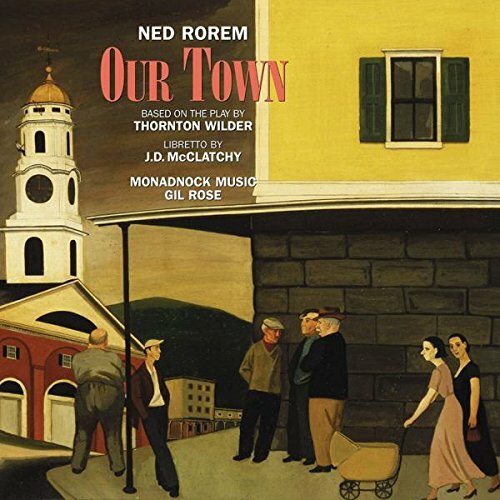 The much-anticipated product of the Wilder estate’s trust in one of America’s most gifted composers of Art Songs, Ned Rorem’s Our Town was jointly commissioned by Indiana University, Aspen Music Festival, Lake George Opera Company, University of North Carolina School of the Arts, Opera Boston, and California’s Festival Opera. With a deftly-crafted libretto by J.D. McClatchy, author of the Metropolitan Opera’s clever English abridgments of Mozart’s Die Zauberflöte and Rossini’s Il barbiere di Siviglia, Rorem’s opera was first performed by Indiana University Opera Theater on 24 February 2006. In the subsequent decade, performances have followed throughout the United States and in the UK. Too many contemporary operas, especially those in English, are governed by the aesthetics of Broadway rather than those of opera, presumably a misjudgment born of well-intentioned efforts at closing the gap between the often-lampooned traditions of grand opera and modern audiences’ technology-shaped sensibilities. In his music for Our Town, Rorem achieved a style that sounds derived from rather than imposed upon Wilder’s text, providing the playwright’s characters and scenarios a distinctly operatic identity that engages without pandering to popular tastes. Musically, Rorem’s score is a thoughtfully-crafted work of great emotional depth that punctiliously preserves the play’s groundbreaking metatheatrical structure. Complementing Wilder’s stipulation that the play be performed with minimal scenic effects, the composer’s music is generally sparse, the instrumental part writing supporting communication of the text with little post-Wagnerian orchestral commentary. The innate lyricism and whimsy familiar from Rorem’s art songs are also present in Our Town, but they are integrated into a discernible dedication to begetting musical and dramatic continuity. That the score’s tonal language is approachable and logical is not indicative of simplicity or a lack of originality. There are suggestions of Britten’s Albert Herring in Rorem’s music for Emily’s and George’s awkward courtship, and the disconcerting atmosphere of Tippett’s Knot Garden is recalled by Our Town’s final scene. Naturally, there are also fleeting reminders of Rorem’s 1965 Strindberg-based opera Miss Julie, but the sonic landscapes of Our Town are predominantly unique to the composer’s musical portrait of Grover’s Corners. In this world-première recorded performance by Monadnock Music, situated by New World Records in an acoustic evocative of a small theatre appropriate for the intimate intricacies of Our Town’s—Wilder’s or Rorem’s—emotional relationships, Gil Rose’s conducting provides Rorem’s score with advocacy akin to Beecham’s Berlioz, Böhm’s Richard Strauss, and Mackerras’s Janáček. Above all, Our Town is a theatrical experience that must not be allowed to wallow in saccharine sentimentality, and Rose never allows the momentum in this performance to decelerate. The nods to the familiar strains of popular hymns and the Wedding March from Mendelssohn’s incidental music for A Midsummer Night’s Dream are handled by Rose with adroitness equal to the cleverness with which Rorem plaited them into the score, and the conductor’s tempi consistently realize the composer’s intentions. Perpetuating the ethos of Rose’s leadership, the Monadnock musicians’ playing is rhythmically, intonationally, and temperamentally precise. Our Town is an opera in which both music and drama are driven by words, and Rose and the instrumentalists ensure that the orchestra converses with the singers in this performance without overwhelming or upstaging them. Even with a handful of largely inconsequential characters being unheard [as a matter of family pride, I must object to the elimination of Grover’s Corners’ steadfast milkman, Howie Newsome], Rorem’s Our Town requires a large cast of singers capable of creating individual characterizations that convincingly weave into playwright’s and composer’s tapestry depicting life in Grover’s Corners. The Monadnock Music choristers—sopranos Lindsay Conrad, Rachele Schmiege (heard, too, as the Lady in the Balcony), and Sarah Kornfeld; mezzo-sopranos Thea Lobo, Christina English, and Stephanie Kacoyanis; tenors Stefan Barner, Jason Connell, and Jonas Budris (also depicting George’s friends and baseball teammates Joe Crowell, Sam, and Frank); and baritones Jonathan Nussman, Jacob Cooper, and Graham Wright (doubling as the Man in the Audience)—impress individually and in ensemble, their singing of the traditional hymns that are an integral part of the opera’s story unfailingly musical but credibly congregational. The doggedly conventional Mrs. Soames is enlivened by mezzo-soprano Glorivy Arroyo’s clarion vocalism and dramatic vigor, not least in the Act Three scene in the cemetery in which her spirit chastises George for his display of grief at Emily’s grave. Similarly, tenor Stanley Wilson is an aptly cantankerous Simon Stimson. Exasperatedly rehearsing the church choir in Act One, Wilson sings both ‘Music isn’t good when it’s loud / Leave loudness to the Methodists’ and ‘I want them to feel / All I get is squeals!’ with an unmistakable aura of artistic superiority. When Stimson sings from his grave in Act Three, the tenor exhibits great depth of feeling in his delivery of ‘Here is our peace, here is our hope.’ There are parallels between the ambiguity of reality in Our Town and Bohuslav Martinů’s exploration of a similar theme in his opera Julietta, and the singers in Monadnock Music’s performance of Rorem’s score convey the emotional emptiness of Grover’s Corners’ society by delivering their parts so meticulously. The composer’s writing for the townspeople is music that revels in what the Quakers termed ‘the gift to be simple.’ Poetry, this music suggests from the perspective of Grover’s Corners, is for people with offices in skyscrapers and suburban housewives who wear trousers and read magazines. One feat of Rorem’s ingenuity is exemplified by his creation of music that exposes but never openly ridicules or condemns the banality of ordinary lives. Portraying George’s and Emily’s parents, baritone Donald Wilkinson and mezzo-soprano Krista River as Dr. and Mrs. Gibbs and baritone David Kravitz and soprano Angela Gooch as the Webbs bring their characters into sharp focus, using Rorem’s vocal lines to create vivid but uncaricatured portraits of these stalwarts of small-town social hierarchy. In the Act Two scene in which Mr. Webb offers George advice about building the foundations of a successful marriage, Kravitz voices ‘Patience and an open heart, George, that will suffice’ with both sincerity and humor, the warmth of his tone imparting the character’s paternal tenderness. The Act One duet for Dr. and Mrs. Webb, ‘The moon just sits and waits,’ is beautifully done, and Wilkinson responds to a question about temperance in Grover’s Corners with a wry statement of ‘Some folks keep a little liquor in the medicine chest.’ Gooch phrases one of the most significant lines in the opera, Mrs. Webb’s remark to Emily in Act One that ‘You’re pretty enough for all normal purposes,’ straightforwardly, unmistakably limning the long-established desirability of finding one’s destined place in life and filling it without complaint. At Emily’s and George’s wedding in Act Two, Gooch’s unexaggerated articulation of ‘Why on earth am I crying’ offers a momentary glimpse behind the façade of imperturbability cultivated by the denizens of Grover’s Corners. Despite their adherence to the paradigms with which they are comfortable, Emily’s and George’s parents are the bridges that connect the youngsters with both the antiquated ideals of their native town and novel notions. The capably-voiced utterances of the quartet of singers to whom the rôles are entrusted in this performance affirm that it is with the elder Gibbses and Webbs that our town begins to seem more like their town. The young lovers George and Emily are brought to life with charm and disarming dramatic verisimilitude by tenor Brendan Buckley and soprano Margot Rood. It is their conscious efforts at being unremarkable—Emily’s bewildered contemplation of the journeys of idiosyncratically-addressed letters and George’s decision to forgo college in order to manage his uncle’s farm, for instance—that differentiate them from their neighbors. For most of the residents of Grover’s Corners, fitting in comes naturally. In their characters’ bumbling romance, Rood and Buckley sing fervently but with appropriate restraint. Rorem has not made them a New England Tristan and Isolde, and they draw from their music well-considered accents of thoughtful young people gently nudging themselves and one another beyond the reaches of their familial safety nets. The ambivalence expressed in the wedding scene in Act Two, epitomized by the couple’s anxious internal queries of ‘What am I doing here,’ is echoed in the conviction with which the singers voice these words. The psychological nuance that George and Emily display is at odds with their environment, and Rorem’s music recalls Britten’s juxtapositions of simple and complex emotions in A Midsummer Night’s Dream. In the context of an audio recording, one cannot see George as the grieving husband whose public mourning in Act Three inspires the deceased Mrs. Soames’s disapprobation: if the singer cannot win the listener’s sympathy with his vocal acting, a measure of George’s hesitant originality is unrealized. Occasionally encountering problems at the top of his music’s range, Buckley is a persuasive George; if not a bonafide operatic lover in the fashion of Puccini’s tenor protagonists, an earnest fellow who sings handsomely. Rood, too, is taxed by some of her music, not least in Act Three, but her resilience is laudable. The immediacy of her performance in the throes Emily’s impassioned rejection of reclaimed life brings to mind the young Galina Vishnevskaya’s conflicted Tatyana in Tchaikovsky’s Yevgeny Onegin. Buckley and Rood dive into George’s and Emily’s intertwined emotional depths but are never in peril of drowning in them. Musically, even their momentary struggles are resourcefully used as aspects of effective, affecting portraits of two of American theatre’s most iconic characters. Playing the part of the omnipresent Stage Manager, a sort of Evangelist in Wilder’s, McClatchy’s, and Rorem’s Everyman’s Passion, tenor Matthew DiBattista faces formidable musical and histrionic challenges. In spoken theatre, the proverbial fourth wall can be broken by merely targeting a receptive face in the audience when enunciating lines, but opera audiences are accustomed to having words and notes hurled at them by unimaginative singers. In opera, the crucial difference between an aside upon which the listener eavesdrops and a line directed specifically to the listener can be virtually imperceptible. That DiBattista handily initiates one-sided dialogue with the listener in this performance of Our Town is evidence not only of his theatrical savvy but also of his trust of the communicative capabilities of Rorem’s music. DiBattista’s Stage Manager is at once the musical personification of Wilder, McClatchy, Rorem, and Grover’s Corners itself: both narrator and participant, he propels the drama by melding into it. The tenor’s singing of ‘They don’t understand, do they? They never understand’ in Act One is resigned rather than accusatory, and the bright sheen of his timbre lends his diction an edge that heightens the impact of his words. The subtly of DiBattista’s voicing of ‘It’s quiet in our town of an afternoon’ suggests a mixture of ennui and relief. At the start of Act Two, a similar mood permeates his statement of ‘Well, friends, three years have gone by.’ In Act Three, DiBattista’s Stage Manager guides the newly-dead Emily sensitively, allowing her to make her own decisions and learn from the errors of her experiences. The Stage Manager’s music traverses a wide range, and DiBattista’s upper register is intermittently strained by Rorem’s demands. His performance is hauntingly memorable in ways that actors’ portrayals of the Stage Manager rarely are, however. DiBattista’s singing exudes true concern for the people with whom the Stage Manager interacts, including the listener, and he earns the attention and appreciation of his audience. Its creator’s stipulations for minimalist staging notwithstanding, Thornton Wilder’s Our Town is a masterwork of modern American theatre that in performance can leave an observer feeling that something is missing. In many productions, it is difficult to feel for Emily, George, and their neighbors the sort of sympathy that audiences have for Shakespeare’s Romeo and Juliet, Rostand’s Cyrano de Bergerac, and Miller’s Willy Loman. Wilder undoubtedly intended for audiences to be enlightened, not enamored, by his characters, but, whether it is Wilder’s Emily, Brecht’s Mutter Courage, or Kushner’s Prior Walter upon the stage, efforts at edifying the mind are aided incalculably by allure that enchants the senses. Even the doldrums of Grover’s Corners impart their lessons more readily when they are dressed in the colors of New England sunsets and autumn foliage. Hearing this moving opera performed so appealingly fosters the impression that what has been missing from performances of Our Town is Ned Rorem’s music.